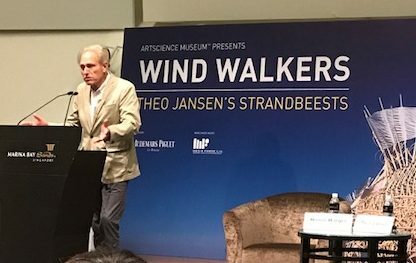 From 23 June to 30 September 2018, the Singapore ArtScience Museum will be showcasing Dutch artist and engineer Theo Jansen’s inaugural Southeast Asian exhibition titled “The Strandbeests”, which boasts 13 large-scale, wind-powered beasts that promise to leave you in wide-eyed wonder. 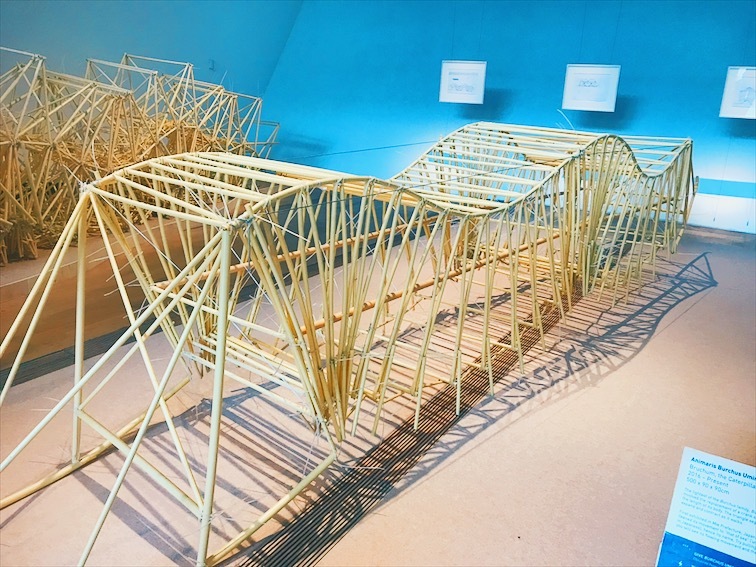 In his exhibition, Jansen makes headway in dissolving the wall between art and engineering. 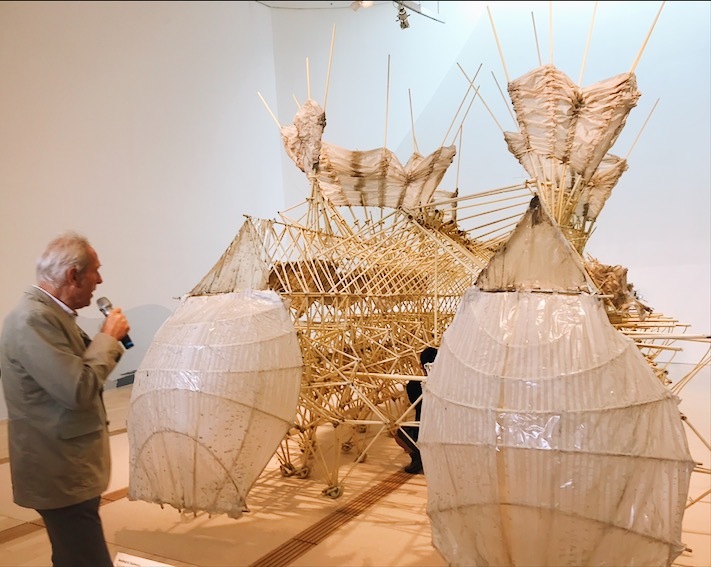 The Strandbeests (Dutch for “beach animals”) are a flock of hulking, walking kinetic sculptures made out of PVC tubes, plastic bottles and sails, built upon Jansen’s understanding of physics as well as his artistic flair. 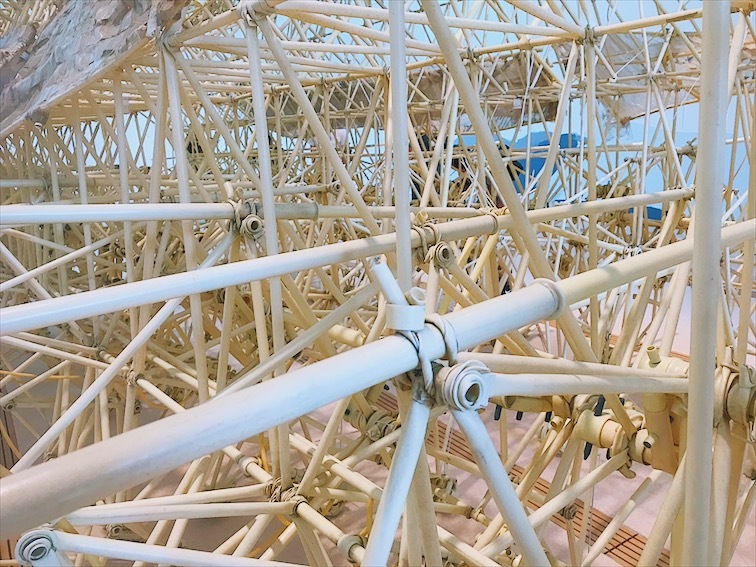 His Strandbeests are so unique and iconic that they have even appeared in an episode of The Simpsons, attesting to the far reach of Jansen’s art. In a press conference, Jansen shared that he studied physics at Delft University of Technology and he felt the pull instead to make art. He thus left university to become an artist. 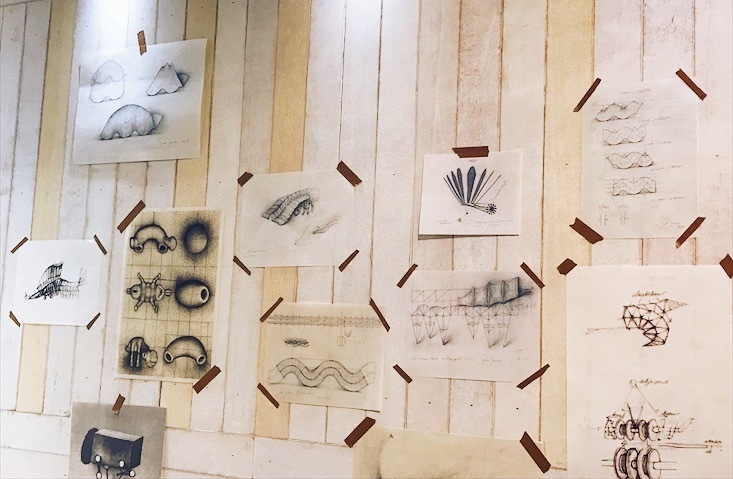 In the process of creating art, Jansen’s background in aeronautics and robotics from his university days came back to him naturally, thus shaping his creative output. This personal tidbit is reminiscent of the famous Leonardo Da Vinci, who was famous for combining both art and science. 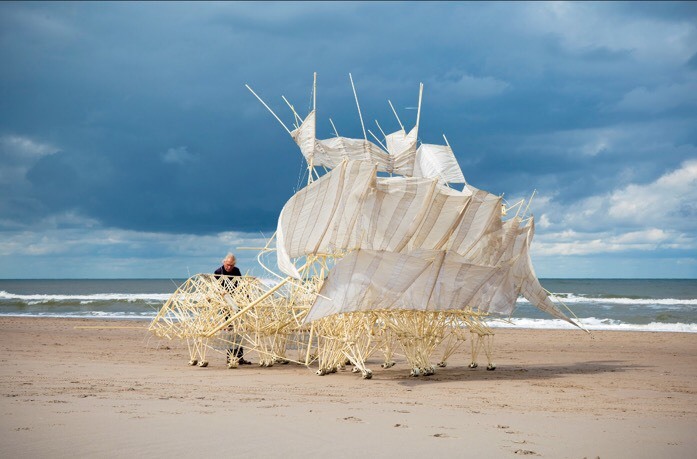 One interesting thing about the Strandbeests was that their gait is quite similar to that of a real animal. When watching the Strandbeests walk, I could not help but struck with the feeling that I was watching real animals move. This brings to mind the quote “life imitates art, and art imitates life”, truly capturing the essence of bringing art to life. Jansen remarked that the process of creating the sculptures was unpredictable. He claimed the sculptures “build themselves”, and so he let them guide him. According to him, the tubes used to make the sculptures were hard to control. Instead of him using the tubes, they used him, the artist, to come to life, giving the impression that the artist is not doing anything fantastical, but merely acting as a medium through which art flows and spreads to others. “Let the tubes talk, let the tubes create, just like how protein created our bodies,” he explained. Theo Jansen at the press conference. The Animaris Burchus Uminami is modelled after a caterpillar. It moves in an undulating fashion, bearing a striking resemblance to the caterpillars that we see in daily life. Visitors can give the Uminami a pull to observe how it moves. Theo Jansen and his Animaris Umerus Segundus. The Animaris Umerus Segundus is a giant creature with a protruding snout resembling that of a hog and numerous flaps on top of its body. It moves sideways, reminiscent of a crab walking. The sheer size of this creature inspires fear and awe, making it seem like a beast come to life. The plastic bottles lining the creature’s spine store compressed air that can be used as an energy reserve for movement, showing Jansen’s engineering ingenuity. This creature comes to life from Monday to Thursday at 11am, 2pm, 3.30pm, 4.30pm and 5.30pm, during special sessions where it will be reanimated by museum assistants. Theo Jansen introduces the Animaris Siamesis. The Animaris Siamesis weighs over 200kg with 72 legs. 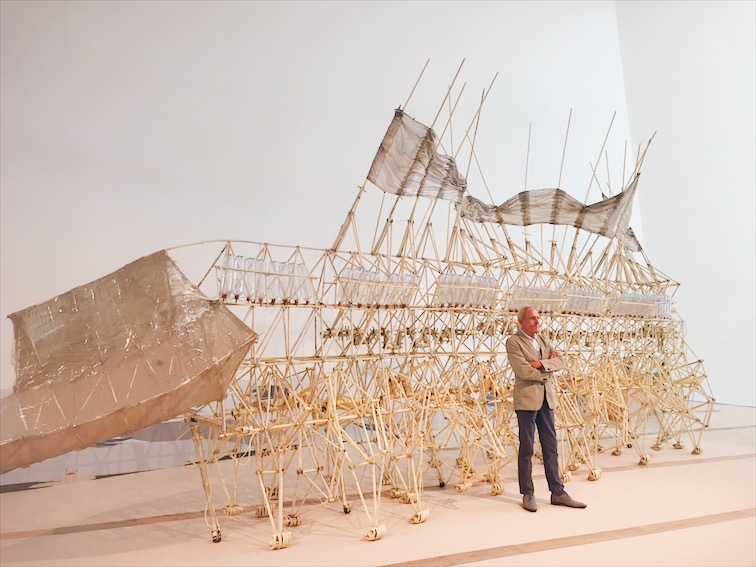 It is the largest Strandbeest Jansen has made. As its name ‘Siamesis’ (Latin for ‘twins’) suggests, it has 2 bodies anchored onto each other for stability. Like the Umerus Segundus, it also walks sideways, but with two separate pairs of legs. Witness the Siamesis come to life on Friday to Sunday at 11am, 2pm, 4pm and 6pm at the museum. A peep into the vast exoskeleton of the Animaris Siamesis. At the end of the exhibition, I was struck by a certain paradox: the creatures possess a certain unpredictability of movement even though they were created from scratch by man, truly showing how art comes to life. There are many more creatures to be discovered apart from the above-mentioned. This is truly an exhibition not to be missed, as you get to interact with the sculptures and watch them move as if on their own will, injecting dynamism into your experience. Tickets: Adults: S$19 (Standard), S$16 (Singapore Residents); Children (2-12 years), Students and Seniors (65 and above): S$14 (Standard), S$12 (Singapore Residents); Family package (2 kids, 2 adults): S$54 (Standard), S$45 (Singapore Residents). Click here for more information. Jia Min is a 20-something who is passionate about trying new things and relaying her honest thoughts and opinions to whoever might stay to listen.